Just an outfit with my new buys;the H&M blazer you've seen in this post,.and the RI floral jeans you've seen here!. When I bought something I really love, like this floral jeans, I would like to wear it everyday... But that's a bit silly right! Tell me, what's your piece of clothes you want to wear everyday? Oh I love the flower pants and the blazer! Wow those pants are great! I love that blazer ! I'd wear it every day too. :D The outfit in itself is gorgeous, love the fresh summery colours. The lace top I'm wearing in my latest outfit post is an item I'd wear every day with everything.. I was really unhappy today when I couldn't pair it with the dress I was planning to wear. :D How sad is that. 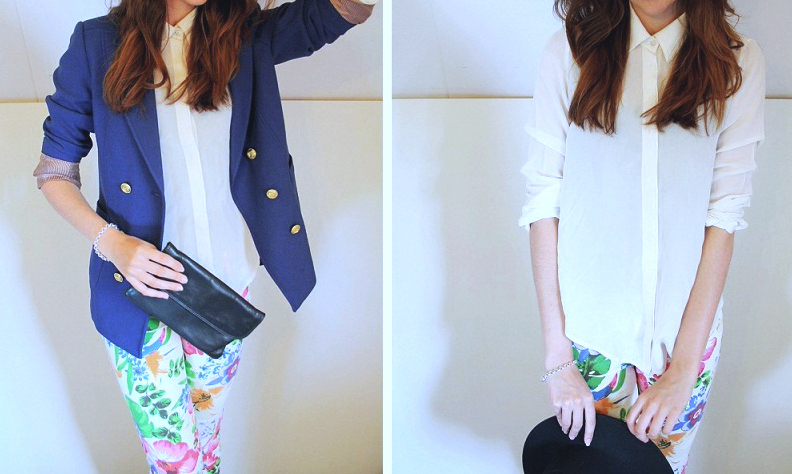 Those floral pants are absolutely AMAZING & I love the blazer!!! Mooie blazer. Echt een leuke combi.